I love my iphone. It is my best friend (besides my husband) and new apps make me happy. Of course, the new app called Ghost Tour has made me really happy. Ghost tour is a new iphone app that uses the built in GPS to locate all the haunted locations around you. 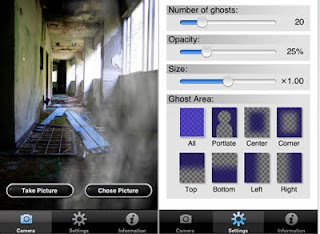 It locates haunted locations around you and gives you directions to them. It also has pictures and stories for each location. This app is a paranormal tourists dream. It will have a data base for every location in the world and be able to direct you to each haunted location. However, since this is a user driven program, those of us who visit haunted places have to build its data base. Currently, there are only two haunted locations in all of Alabama listed. There is only one haunted location listed in Tennessee. Arizona only has one haunted location and Michigan has yet to have any haunted locations added at all. All of this to say, that right now it isn't very useful for finding off the beaten track haunted locations that may be fascinating and wonderful. However, I think I'm going to start adding to their data base. I love haunted trips, so every trip I take from here on out I'm going to register with Ghost Tour. If everyone does this, it will soon be the best app out there. cool, i'm getting an iphone soon! Nice it could be more better if you post video of this iphone app here,otherwise it seems to be an nice iphone app. OH MAN! Another reason I'd love to have the phone, but I think I can still get this on my iPod Touch too. I'll see tomorrow when it's charged up. So cool! GREAT post, Jessica!